So what is there to like about a horse that I can’t enjoy from afar? They snort (scary), they kick (scary), they neigh (or whatever it’s called when they get up on their hind legs) (also scary), and they fill in the blank: “Wild ___.” Unless it’s 80s “mental,” I don’t like anything wild. I’m sure Greg Minton had none of these issues. He was born in Lubbock, Texas, presumably the heart of Friday Night Lights farm country…although he did have a 3.8 BB/9 rate. But, for two magical seasons (1981 and 1982) he was under control, well, not really. 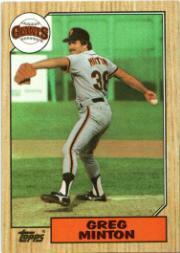 In ’81, he finished a league leading 44 games, pitched 84.1 innings, had a 1.42 WHIP and 0.81 K:BB ratio. He finished 23rd in MVP voting – go figure. 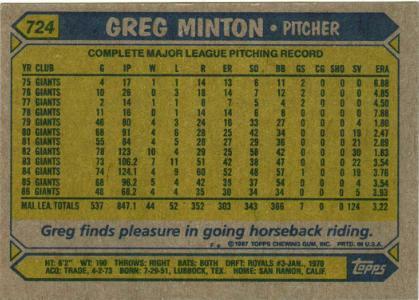 In ’82, he finished a league leading 66 games, pitched 123 innings, had a 1.22 WHIP and 1.38 K:BB ratio. He also had a .269 BABip. His career number was .280. He finished sixth in the Cy Young voting and eighth in MVP. For the next three years, his WHIP was above 1.50 and his K:BB was below 0.85. Shockingly, he would pitch 352.1 more innings after that stretch with a 2.96 ERA, 1.33 WHIP and 1.13 K:BB rate. He’d finish up 59-65 with a 3.10 ERA, 1.38 WHIP and 0.99 K:BB rate in 1,130.2 major league innings. His relief loses, 62, are the 30th most in MLB history. He outpaced Steve Bedrosian and Bob Stanley by one loss. The 1,087.1 innings he tossed in relief are the 25th most ever. He actually threw more relief innings than Mike Stanton and Bedrosian. Go figure, some guys get all the luck. I imagine relievers have the best stories for long horse rides and camp fires, though.